PropellerAds, reviews, discussion and all you need to know - Propellerads is a really good ad network that had been around since 2011. They offer good CPM rates and provide 100% fill rate. There are various things that make this ad network good and different from other ad networks, although it still have its Pros and Cons. Join and be a PropellerAds Publisher here. PropellerAds network is a nice choice for both medium and large publishers as it provides various ad formats including mobile advertising. So, publishers can monetize their full inventory with this network. Approval is instant, and they accept 99% of all types of web and mobile sites that wants to monetise its traffic. They automatically optimize any website and serves best ads based on various factors like country, device, website niche, language, OS etc. It offers above average CPM rates, so, you can earn a decent income from this network. They have 3000+ active ad campaigns worldwide and therefore, you can expect 100% fill rate from them. They provide great safety to publishers. Their team manually check all the ad campaigns and exclude all unsafe and suspicious ads/advertisers. Their finance team knows the importance of timely payouts and therefore, they make timely payments to ensure brand safety. They provide in-depth real time stats reporting which let you quickly optimize your ads for best performance. They offer a great support to their clients. Their support staff is very responsive and they remain ready to assist publishers and advertisers. PropellerAds offers various different ad formats for both web and mobile traffic. It offers Pop Under Ads, Banner Ads and Direct Ads (Full Page Ads) for web advertising whereas it offers Dialogue Ads/Push Up Ads and Interstitial Ads for mobile advertising. - The Pros, the above details can be categorised under Pros in PropellerAds, including prompt Support and Live chat working 8:00 am - 5:00 pm GMT to help you publishers quickly. -The Cons is the fact they don't offer rotating Banner ads units which you can simply use like that of AdSense. Secondly, the ads installation on some platforms like Blogger is quite technical but it's still something you can do yourself if you follow their Documentation And Integration guide carefully. Now there's a great news, minimum Payout is now $25, this is to fulfill publishsers' feedback after some long while. The below was according to the mail sent by PropellerAds to its publushers. To all our new Partners registered after 1st October 2017. To our current partners who have previously had at least 1 payout (>$100) from PropellerAds. Now you can withdraw your earnings as soon as they reach $25. If your current balance is below $100 and you didn’t have any payouts previously, please wait until your balance reaches $100 and request the first payment. Right afterward the minimum for your account will be lowered to $25. Your earnings below $100 cannot be transferred from your current account to any other. How to set $25 payout for your account? Login to your PropellerAds Publishers account. Find the “Min. withdrawal amount” form. If your account meets the necessary conditions, you will have an opportunity to change your minimum payout value to $25 by typing 25 in the form. The advert network is a great choice and had been welcomed and been used by a lot of pbulishers already. 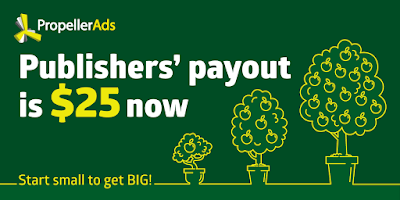 You too can Join and be a PropellerAds Publisher here so you join others to earn big.